What happens when it’s your brothers birthday and he has two favourite desserts?? Sticky toffee pudding and banoffee pie are his picks! I had to combine the two and along came this delicious creation. As it was a birthday, I didn’t really try to reduce the sugar or decadence but I have a few simple substitutes to make it less sugar loaded but still decadent. The caramel sauce can be made in advance and stored in an airtight container in the fridge. Likewise, the cake could be made, cooled and frozen – allow to fully defrost at room temperature before adding the toppings. Makes a 21cm round cake or 1 loaf. Preheat an oven to 200°C/180°C fan/400°F. Line a loaf/cake tin with parchment. For the cake tin, place a parchment disc in the base and dust the sides with flour. Cover the dates with hot tea and allow to soften. Beat the butter and sugar together in a large mixing bowl with a stand or handheld electric beater until soft and fluffy. Beat through the eggs until well combined. Fold in the sieved flour, baking powder and soda until no flour is left. Pour the cake mixture into the prepared tin, place in the oven and bake for 40-45 minutes or until a skewer comes out clean. Remove from the tin and allow to cool on a wire rack. For the caramel sauce: If making the date caramel version follow this recipe. Otherwise, place the butter and sugar in a small saucepan over a medium heat. Once the butter has melted, stir regularly until the sugar has fully dissolved. Add the cream and allow to bubble up, reduce the heat to low and continue to cook until a dark caramel colour is created and the sauce is thickened. Remove from the heat and allow to cool. Mix the banana slices with the lemon juice to prevent browning. 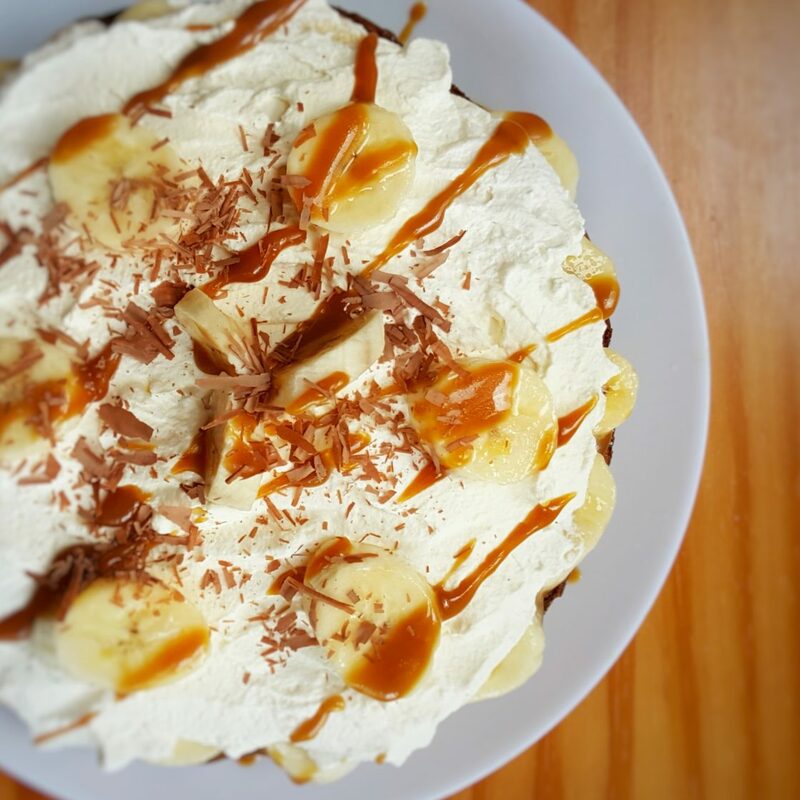 To serve: spread a thick layer of caramel over the cooled cake, followed by 3/4 of the banana slices, spread the yoghurt on top (if using cream, whip into soft peaks first) and finish with the remaining banana slices, chocolate curls and a drizzle of caramel sauce. Serve immediately or keep fresh in the fridge.